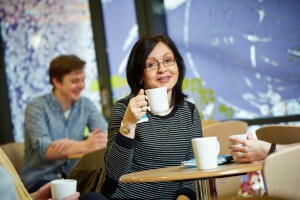 The Whiteleaf Centre has a range of facilities on site for staff, patients and visitors. In addition to the clinical facilities which are described in ‘our services’, we have a resource centre with café and conference rooms available. There are signposted and designated spaces for staff, visitors and patients onsite. We operate pay and display facilities; you must buy a ticket for the required time period from the pay station and display it in your vehicle. If you are a Blue Badge holder you can park in designated disabled space free of charge. The café is usually open from 8.30 am to 4 pm, serving a range of hot and cold drinks, a freshly made sandwiches, soup, salads, cake and other snacks. We have a conference room which can seat 50 people. It can be laid out in a number of ways to accommodate any need from table group discussions to theatre style. The room is fully equipped with a state of the art lectern and smart screen. For anyone wanting to use these great facilities, please let us know your requirements in advance so the room and equipment can be set up ready for you. It is conveniently located next to the café so you can hold a meeting with catering if required. For details of cost and availability please call 01865 902000.